On Labor Day, fast-food workers across the country once again went on strike for workers’ rights. They were joined by teachers, hospital employees, day-care workers, and others in the latest nationwide demonstration by the Fight for $15 campaign. The last major protest was on the campaign’s four-year anniversary on November 28, when hundreds of demonstrations were held across the country just weeks after Donald Trump’s election. This time, protesters gathered in cities — including Boston, Chicago, Kansas City, Phoenix, Des Moines, Orlando, Detroit, Richmond, and numerous others. Many of the strikers walked out of work on a holiday ostensibly meant to celebrate the American labor movement, and the contributions of working people to the United States, but which they are seldom able to enjoy. 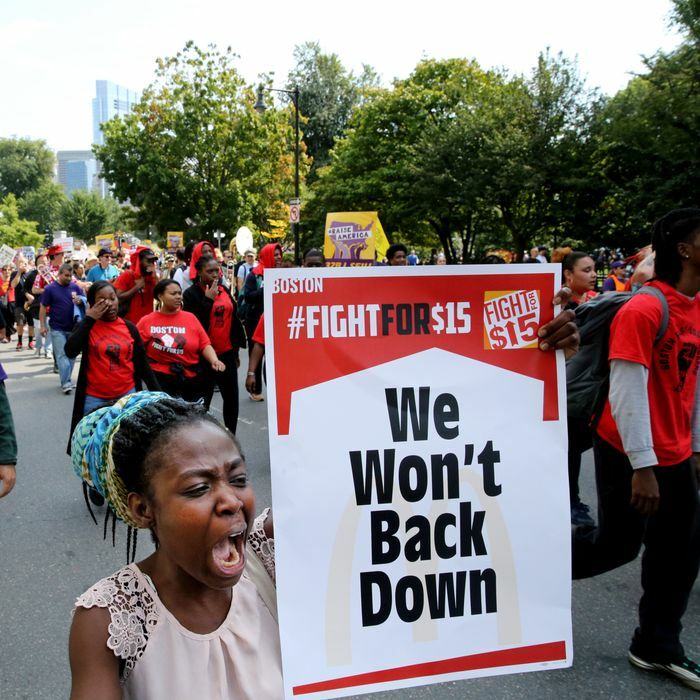 Since the Fight for $15 campaign began, states, including California and New York, have passed legislation to gradually raise the minimum wage to $15. Illinois governor Bruce Rauner vetoed such a bill in August, while in May House Minority Leader Nancy Pelosi promised to pass a $15 minimum wage if Democrats take the House of Representatives next year. The protests weren’t just for livable wages, but for unions and against exploitation of workers. A Fight for $15 release said that workers were striking to declare unions as “the best way to fix the economic and political systems that have been rigged,” an argument repeated at protests. In Des Moines, Iowa, congressional candidate Pete D’Alessandro said, “The fight for 15 … starts at $15,” and that the goal is that “everyone in this country has a chance to organize in a proper union.” Major political and activist figures attended once again, including Representative Keith Ellison in St. Paul, Minnesota; Reverend Dr. William Barber II in Chicago; and Representative Emanuel Cleaver in Kansas City.